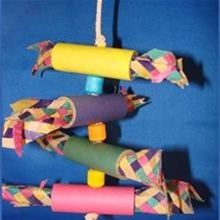 Colorful cardboard tubes stuffed with colored Shredders. Tear 'em up! Hangs with nickel-plated pear link or optional ss quick link. This was the first new toy addition to our adopted Quaker's cage. On her first day while we were all at work/school, she must've had a great time with it. We knew she liked shredding toys best and this toy looks like it kept her entertained for a while! The edges on one side all got some "attention" and we're very happy with the product!